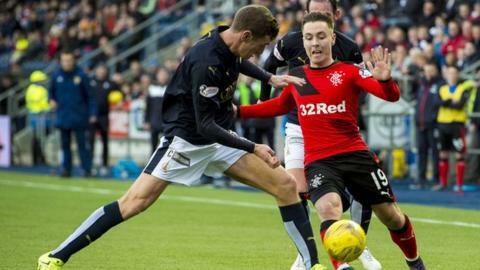 League reorganisation could soon be back on the agenda for Scottish clubs, with Falkirk keen to start a dialogue about changing the present structure. Bairns chairman Doug Henderson has raised restructuring as an item for discussion at a meeting of Scottish Professional Football League clubs. A three-year moratorium not to re-visit the issue ends this summer. "Change can be achieved as quickly as people want to achieve it," Henderson said ahead of Tuesday's summit. "A lot of people that I talk to - coaches, supporters, players, even the general public - have quite strong views and most people think that some action needs to be taken. "Our international side doesn't perform well internationally, a lot of our club sides in Europe are not performing well [and] we're not bringing through enough young players. "A lot of coaches say to me the only way you can bring more young players, full-time footballers into football is by having leagues which allow a bit more space for, if you like, experimentation or blooding some young players. The current structure doesn't allow that. "Too many clubs are too wary of playing young players in case it ends up in disaster for them and that they don't achieve what they think could achieve, especially if, for instance, they're in the Championship seeking promotion or in the bottom half of the Premiership and faced with relegation." In 2013, the Scottish Premier League and Scottish Football League merged to become the SPFL. The four divisions in senior football remained as they were with 12 in the top flight and 10 in each of the other three divisions. However, a new promotion/relegation play-off system was introduced between the top two divisions in addition to the established one up, one down. Since season 2000-01, the top flight in Scotland has spilt after 33 rounds of fixtures. Clubs in the top six then play each once more, as do the bottom-six sides. "I've never met a fan who likes the clubs playing each other four times in a league structure," Henderson told BBC Scotland. "People want to see clubs for a home and away game and they want to see as many clubs as is reasonably possible during a season. "That's why we need to look at a bigger league in the Premiership and then look at whatever consequential restructuring is necessary throughout the rest of the leagues. "Sixteen is a reasonable figure. It has to be bigger than it is at the moment if we're to address this issue of bringing through young players and satisfying the demands of our supporters at all our clubs. "What would the TV companies look for in the next round of television contracts? How can we encourage more people to attend more games? How can we make the games more competitive, more interesting? Should we play football right through the summer? Should we have winter breaks? "We need to look at all of that as one package and see what best league structure fits the modern needs of football in Scotland. "Change will come inevitably and I hope it comes sooner rather than later. "If it can come next season, that's great. If it has to be deferred a little bit longer and we get the right result at the end of it then so be it."